ROUND 2: *Slip Stitch to first SC of magic circle. SC into Ch space of first petal. 2HDC each of the next 4 stitches. Ch1. Slip Stitch to next SC of magic circle. * Do this 5 times total. 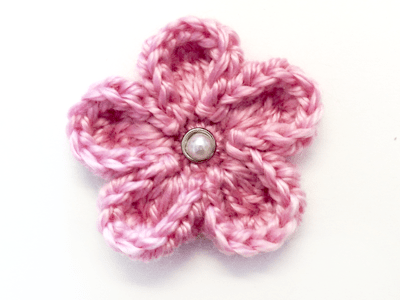 Fasten off; weave ends into back of flower. Finish with embellishment, if desired. For my flower's center, I used a small embellishment brad that I found at my local craft store. You can also find them on Amazon. 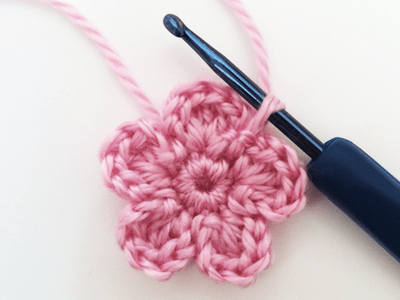 Just slip it through, bend the bendy things back (yep, I think that's the technical name) and you have yourself a cute little flower! 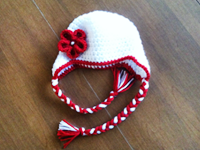 I recently used it on this cute Valentine's Day hat as part of a hat/tutu combo.